Dr. Joseph Son received his Bachelor of Science degree in Biology at the University of Michigan in 2000, and received his doctor of dental surgery (DDS) degree from the same university in 2004. Afterwards, Dr. Son completed a General Practice Residency at the Medical University of Ohio in Toledo, Ohio, where he was trained to manage medically compromised patients. Dr. Son then was accepted into the endodontic residency program at the University of Michigan School of Dentistry, where he received his Specialty Certificate in Endodontics. During his residency, Dr. Son received numerous honors and prestigious awards. He also received numerous awards for his research "VEGF expression in human dental pulp cells by Porphyromonas endodontalis lipopolysaccharide." including winning the first place in the poster research presentation at the American Assocation of Endodontist national conference. Dr. Son also received the Robert Ellision Award and John F. Corcoran Award for his outstanding knowledge of the endodontic literature. Dr. 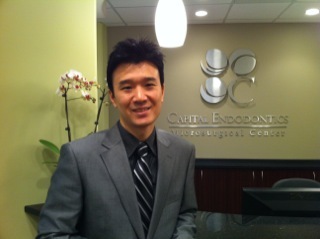 Son founded Capital Endodontics and Microsurgical Center in order to provide personalized treatment for his patients with the most up-to-date, cutting-edge technology to ensure the best quality of care in the most comfortable environment. Dr. Son resides in Rockville, Maryland with his wife Sophia and lovely children Rachel and Daniel.